I have quite a collection of watercolour washes, where I have just played with colour and textures. This painting was a very subtle wash, so a little easier than most to try to paint something on top that was not planned originally, I decided on a dolphin, with very little detail, the salt effect on the wash, was very waterlike, and I also added salt to a very watery dolphin, ( I used a lot of water with the paint). I had planned on painting in some more detail, but good old dad said NO! Leave it as is, so I have. a good use of old practice washes I think. 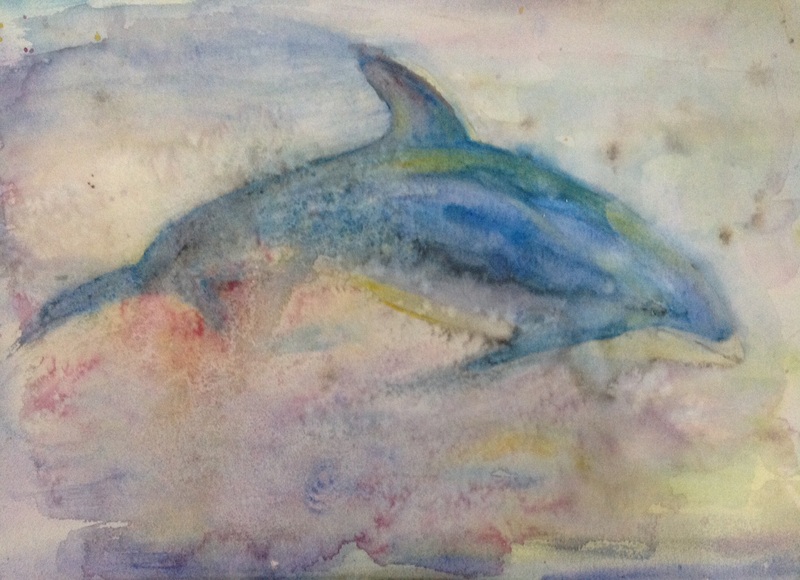 This entry was posted in art, dolphin, washes, watercolour and tagged art, dolphin, painting, Painting, washes, watercolour. Bookmark the permalink. …it is very effective and indeed is ‘very waterlike’, so suiting of the subject. I agree with Lance. This is quite lovely! Thank you Laura and Lance, it proves that it is in the knowing when to stop…. Thank goodness for my dad!